Ko Ang Seafood is a local restaurant serving excellent seafood on the east side of Phuket Town. 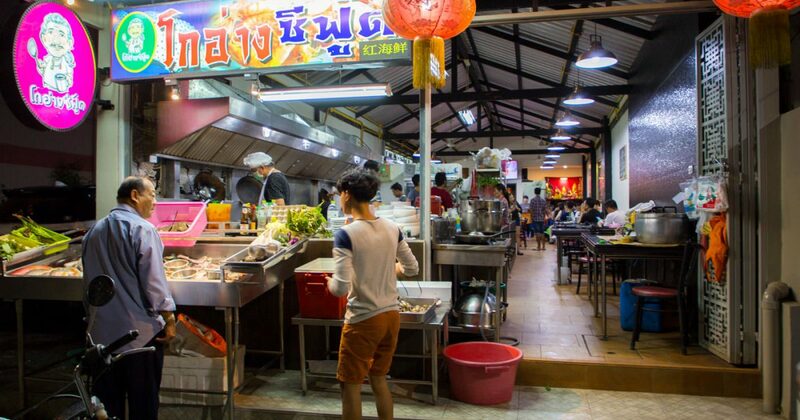 Ko Ang has been around for a very long time and started as a modest shop with no decoration and a zinc roof. 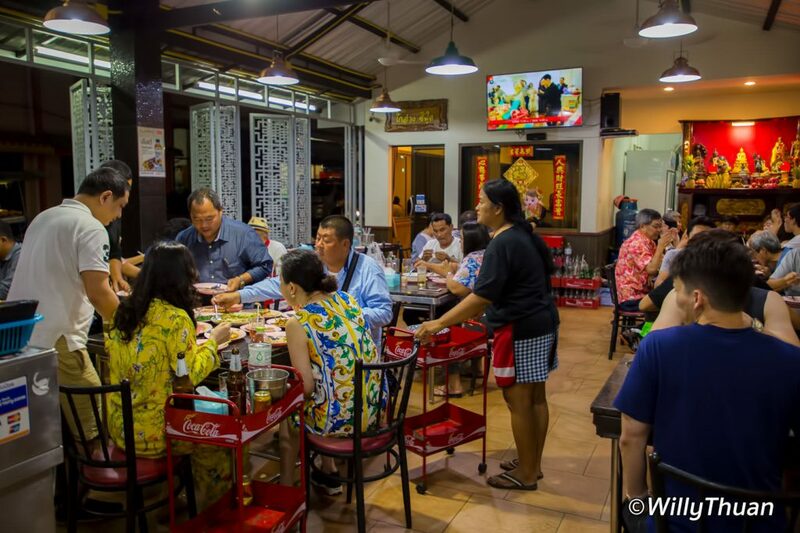 But seafood lovers always find the right places (and maybe we recommended it a lot too) and Ko Ang Seafood is now a bright restaurant and even added Chinese decoration. It still feels local, but it looks a lot nicer. They also have a room with air conditioning if you are not used to the high season heat. Beyond the fact that the chef and his team cook exceptionally well and with an equal passion for many years, what makes Ko Ang unique and popular is the fantastic choice of seafood you can order. You will find some shells that are difficult to find elsewhere. 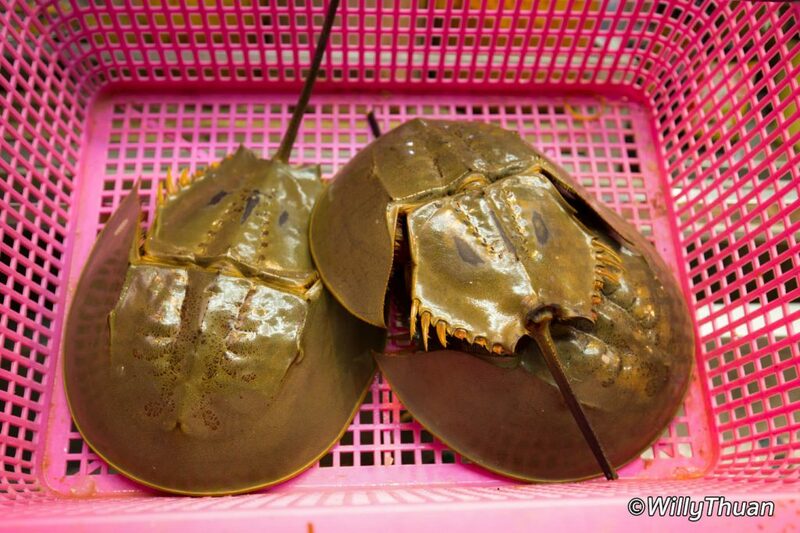 Some of them will even look strange and weird to visitors if they never saw a horseshoe crab or a sea cicada before. Prices might seem a little higher than usual, but locals find it justified for the freshness and the chef skills. It’s a treat and even an excellent experience if you are new to Phuket. Just remember that if you forget to specify, some dishes can be very spicy! Even for us who love it spicy! 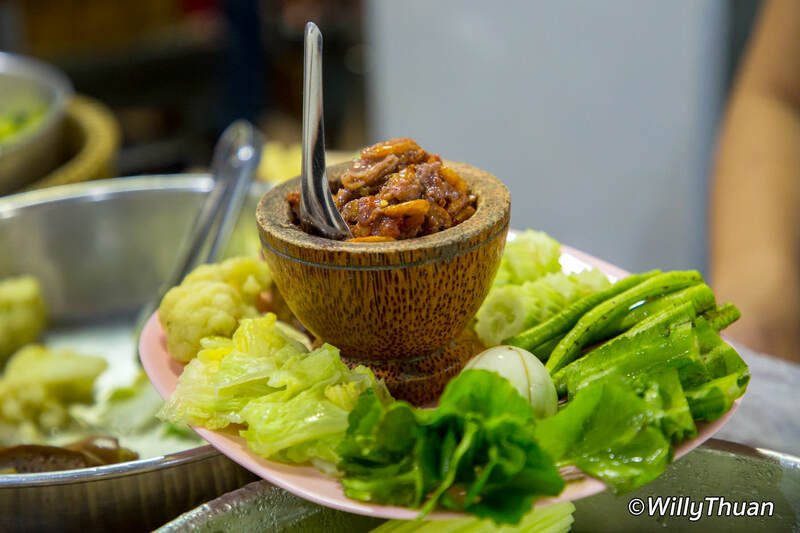 We have been to Ko Ang many times, and since Phuket is famous for some dishes, we often go for those. Some them might be a little too ‘ethnic ‘ for first timers, but you can order more traditional seafood like fish or prawns. 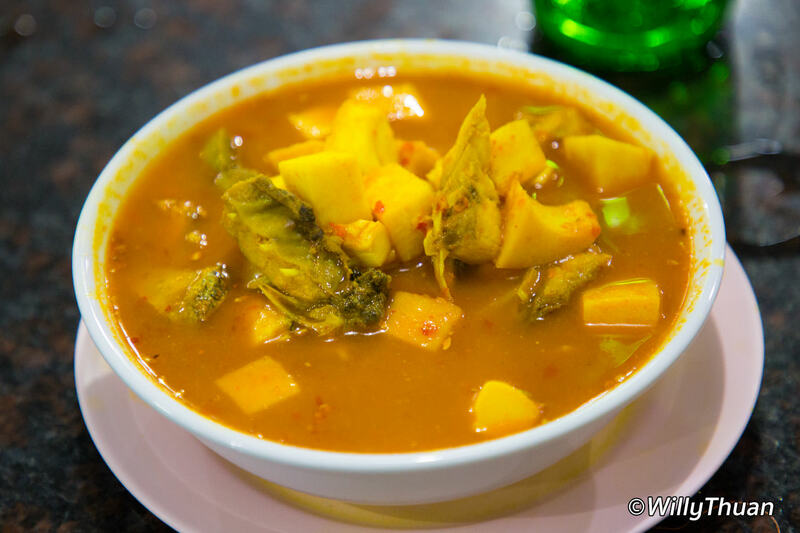 We like ‘Gaeng Som Phuket style’ which is a pungent sour and super spicy fish curry with pieces of coconut and a very typical orange colour. It’s delicious once you get used to it. Then we had our second weird favourite which is Yum Kai Mangda Talay. 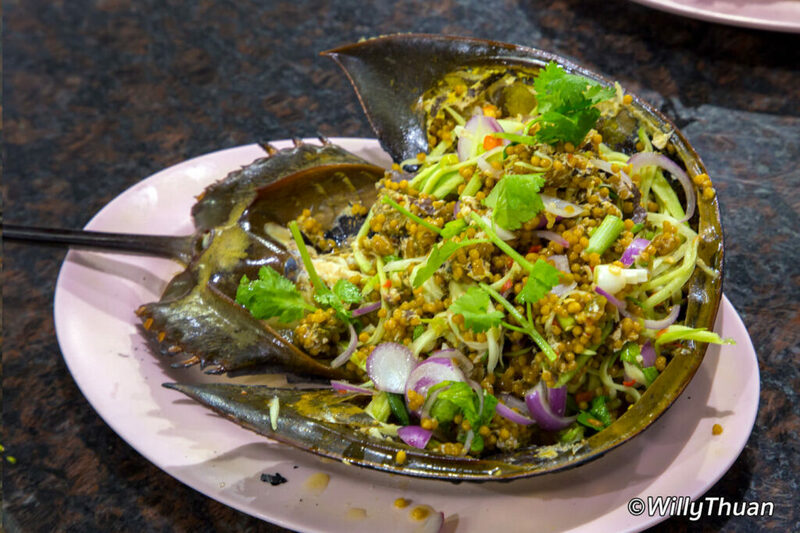 A Spicy mango salad using the eggs of the strange-looking horseshoe crab (see the photo and ask yourself if you would order that). We also had most classic dishes such as fried fish with garlic and steamed prawns, all delicious but we don’t need to describe them. If you are brave, have a look at the fish display in front of the restaurant, you will see things you may never have seen before, such as the red ants’ eggs and fat palm tree grubs we haven’t yet tasted ourselves. We will have to, so at least we will know something new! 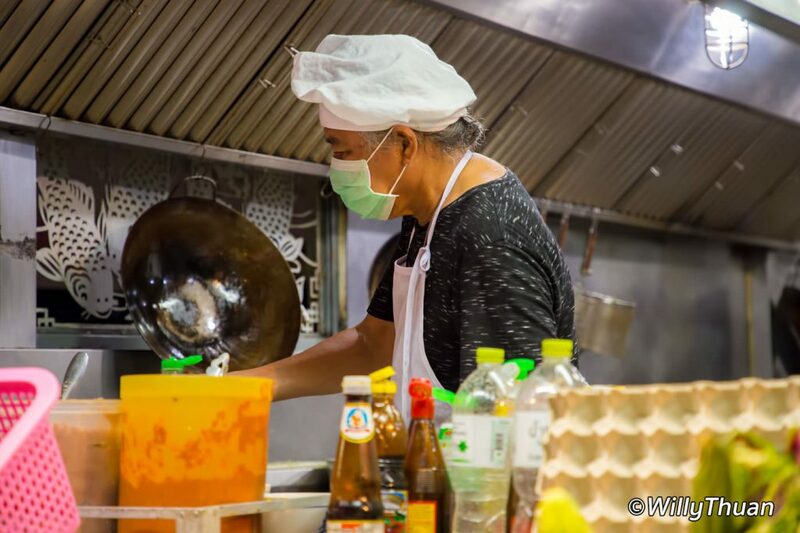 The team at Ko Ang is also very nice and friendly, even though they are always super busy they are friendly and smiling, trying to help as much as they can. Just be ready to wait as there is often a long list of orders before yours.